Keratoconus, a progressive thinning of the cornea the tough transparent curved structure responsible for focusing 75% of the light entering the eye onto the retina is the most common corneal dystrophy in the United States, affecting one in every 1,000 or 250,000 people across all races. It typically begins during teen years and progresses at varying rates until stabilizing usually by age 45. 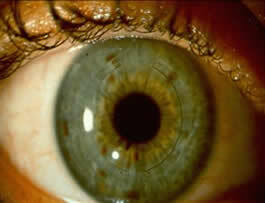 As the central and inferior areas of the cornea thin and gradually bulge outward, a cone-like shape is formed. This abnormal curvature changes the cornea’s refractive properties causing varying degrees of blurred vision and distortion of objects. Occasional swelling may occur which can, in time, lead to sight-impairing cornea scarring. Similar cornea distortion and irregularity can also be seen in certain eyes that had Radial Keratotomy, LASIK induced ectasia or trauma. The treatment for keratoconus occurs in stages, from spectacles to contact lens to surgery typically over many years. Visual quality can initially be restored with spectacle correction or soft contact lenses. If the condition is detected early enough, corneal cross-linking is a promising option, currently in US FDA trials, designed to stiffen the cornea and stop it from gradually deforming. More advanced stages require rigid contact lenses. A proper contact lens fit is crucial to insure optimal vision and comfort. In time, the cornea may become so warped, that contact lenses may repeatedly fall out of the eye or cannot be tolerated because they are too uncomfortable to wear. Historically, cornea transplantation has proven to be a successful treatment option for those patients with late stage keratoconus. However, even after a transplant, glasses or contact lenses are usually required and visual rehabilitation may take many months to achieve. Although keratoconus rarely results in total blindness, 20% of all patients will eventually require a corneal transplant. At this point, INTACS can be considered. These are two semicircular small plastic devices that are threaded into the cornea adding support and making the curvature more regular. In many cases, vision is improved and contact lens tolerance is increased. Intacs® are tiny (0.25mms thick) acrylic ring segments (see figure above). Intacs® were originally designed and FDA approved in 1999 to correct mild nearsightedness (myopia). In July 2004 the FDA approved Intacs® for keratoconus under a Humanitarian Device Exemption. In patients with keratoconus, Intacs® are indicated to reduce myopia and astigmatism in those who are no longer able to achieve adequate vision with contact lenses or glasses. They are an effective way to manage the condition and restore functional acuity by helping to restore the natural shape of a cornea weakened by keratoconus. In a number of patients, Intacs® may delay or ultimately prevent the need for cornea transplantation. Thousands of Keratoconus eyes have been treated successfully with Intacs®. 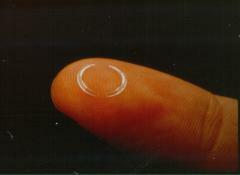 Intacs® inserted within cornea (see figure above). » Intacs® for keratoconus mirror the safety of FDA-approved Intacs® for Myopia. » If required, Intacs® can be removed preserving the option for corneal transplantation. » Intacs® may restore functional vision by allowing the eye to be effectively corrected with contact lenses or glasses if needed. » Intacs® add structural integrity to the cornea without invading the optical zone. » Intacs® flatten and shift the cone centrally, restructuring the corneal architecture to a normal prolate shape (see corneal topography below). 71% gained 1 or more lines of Best Corrected Visual Acuity. 73% gained 2 or more lines in Uncorrected Visual Acuity. 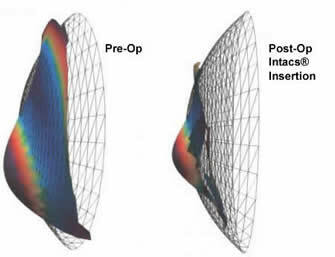 Eyes with worse preoperative acuity had greater improvements in postoperative acuity. Eyes with corneal scarring also showed improvement. If you believe you might be a candidate for Intacs® for Keratoconus contact us to schedule a consultation with Richard A Erdey, MD. IMPORTANT: If you wear contact lenses, you MUST discontinue contact lens use for 2 to 3 weeks BEFORE your consultation. Failure to do so may produce poor examination results. For more information on Intacs® for Keratoconus view the complete patient booklet.